In looking at a ratio of effort put in to a walk in relation to views attained, this walk must rate very highly. The walk, all on tracks, lanes and a short section of a 'B' road is suitable in all weathers, as it keeps quite low, but the views on clear days of Ingleborough, Whernside, Ribblehead viaduct and the general Yorkshire Dales scenery are simply outstanding. The walk follows a short circular route from Chapel-le-Dale, past the church along the track to Ellerbeck. It then heads along the base of Whernside to Bruntscar before joining part of the 'Yorkshire 3 Peaks' route back down to 'B' road near the Old Hill Inn and then on to the car park. Parking: Small car park in Chapel-le-Dale (grid reference SD 738 771) there is also a small amount of roadside parking available nearby and near to the Old Hill Inn, just further along the B6255. Facilities / refreshments: En-route - Philpin Snack Bar. Within 100m of route - Old Hill Inn public house. 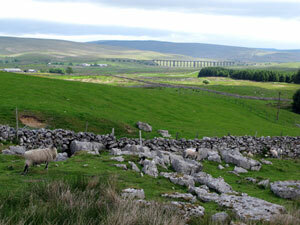 Nearby - toilets, cafes, restaurants and pubs in Ingleton (3 miles) and Station Inn at Ribblehead (2 miles). If you are relying on these facilities, check their opening times before you set off.